The Pittsburgh Penguins have re-signed forward Brandon Sutter to a two-year contract, it was announced today by executive vice president and general manager Jim Rutherford. The deal runs through the 2015-16 campaign, and has an average annual value of $3.3 million. Sutter, 25, is coming off his best playoff performance to date. He set new career highs in goals (5), assists (2), points (7), shorthanded goals (1) and plus/minus (+7), while his 2:57 average shorthanded time on ice per game ranked second among all Pittsburgh forwards. Sutter also recorded a new playoff career-high scoring streak of four games (2G-2A) from Apr. 21-28. The 6-foot-3, 190-pound Sutter suited up for 81 of Pittsburgh’s 82 games in 2013-14, tallying 13 goals and 13 assists for 26 points. Sutter played a vital role in the NHL’s No. 5-ranked penalty kill unit (85%), placing second among all Pittsburgh forwards with 2:18 shorthanded minutes per game. 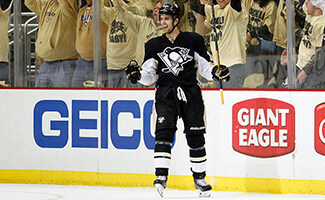 He also scored three shorthanded goals, which was good for first on Pittsburgh and tied for fifth in the NHL. Sutter spent four seasons with the Carolina Hurricanes before being traded to Pittsburgh with Brian Dumoulin and a 2012 first-round draft pick (Derrick Pouliot) for Jordan Staal on June 22, 2012. In his six-year NHL career, Sutter has accumulated 77 goals and 75 assists totaling 152 points in 415 career games. The durable center has missed just one game over the past four seasons and has netted at least 10 goals in each of the last five years. Drafted by the Carolina Hurricanes first round (11th overall) in the 2007 NHL Draft, Sutter played four seasons with Red Deer of the Western Hockey League (WHL) from 2004-08, where he was coached by his father, Brent. With Red Deer, Sutter scored 68 goals and tallied 86 assists for 154 points in 205 career regular-season games. He also took home a gold medal as a member of Team Canada at the 2008 World Junior Championship.